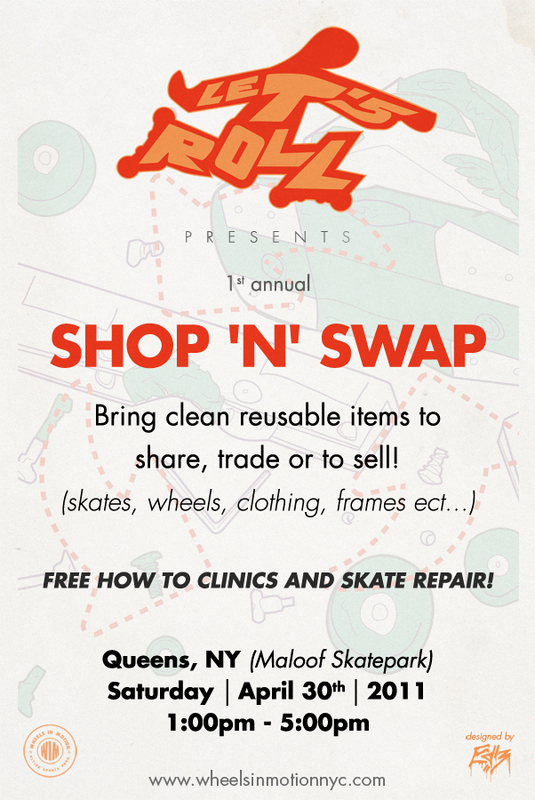 Victor Callender and Wheels in Motion NYC bring you the first Shop ‘N’ Swap event taking place at Maloof skate plaza in Queens, NY on Saturday, April 30th. 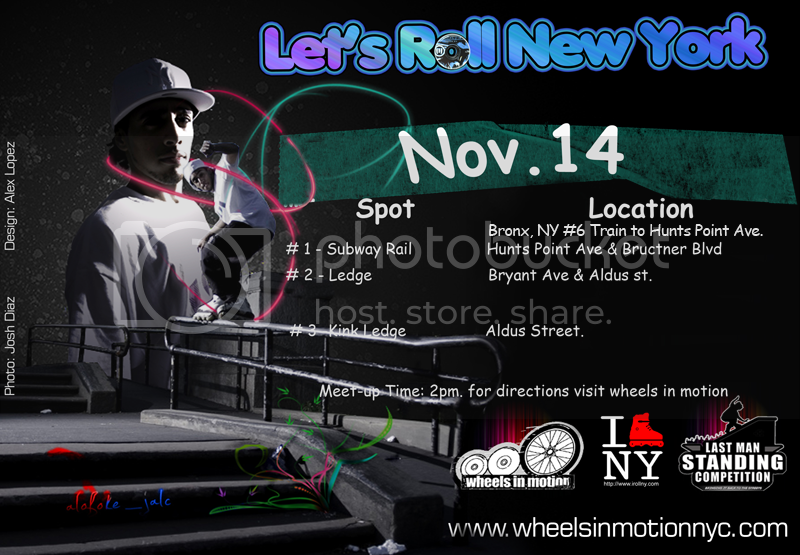 The event is your chance to trade or sell some of your spare parts with other bladers. There will also be a “How To” clinic and free skate repair. Train Directions: 7 train to Flushing-Main Street /Roosevelt Avenue. 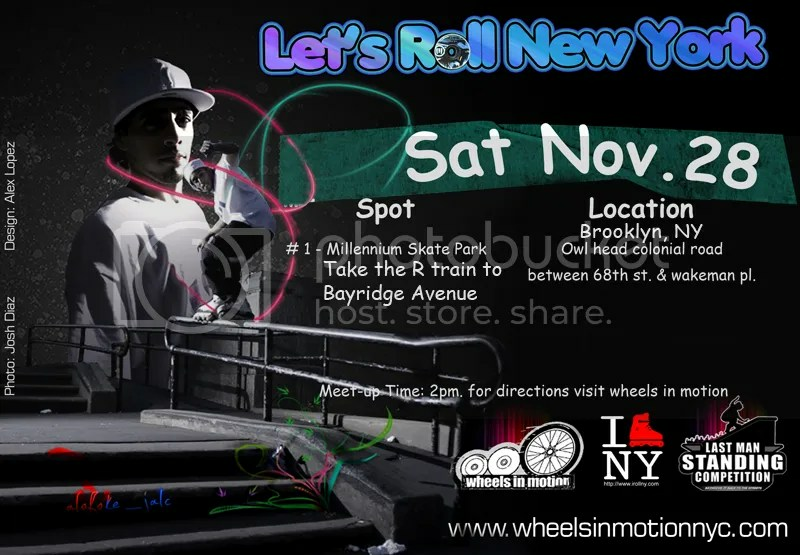 Ray Mendez, Sam Williams, Victor Callender, Wheels in Motion, and Skate Life Pro-motion present the Roll and Rage New Years eve party Friday, December 31st. There is a $20 entrance fee that will include an open bar from 8PM-9PM, 20 foot grind boxes and prails, MC battle, BBoy battle, giveaways and more. There will also be a best trick contest through out the night where the winner will receive $100. It’s all taking place at the St. Cecelia’s Gym in Williamsburg, Brooklyn. More info on the flyer and below. The Nimh video will also be premiering at 9PM! Date: Friday, December 31st, 2010. Time: Doors open at 7:30PM. Open bar from 8:00PM until 9:00PM. Nimh premiere at 9:00PM. Location: St. Cecelia’s Gym. North Henry and Herbert Street. 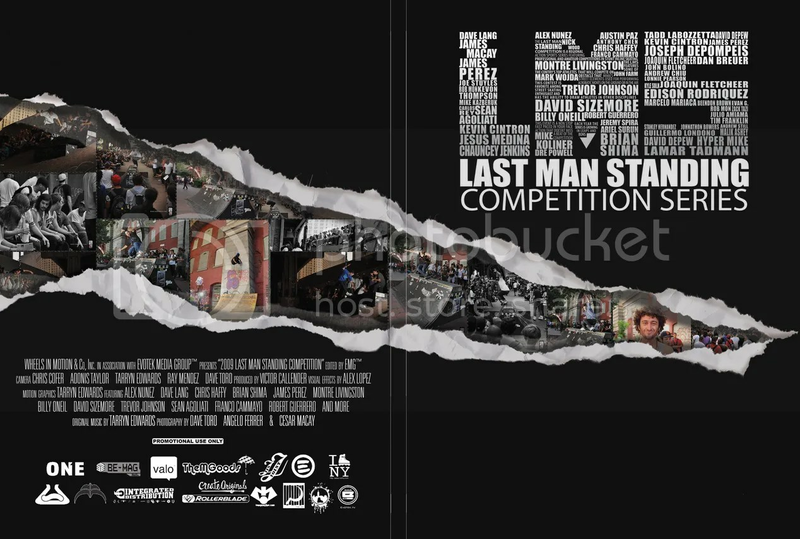 Quoting Victor Callender, “The 2009 Last Man Standing Competition Series DVD is a look into the East Coasts premiere skate event series. Coverage includes: Pre-Contest autograph signing, Let’s Roll Sessions and the LMS/WRS competition finals. 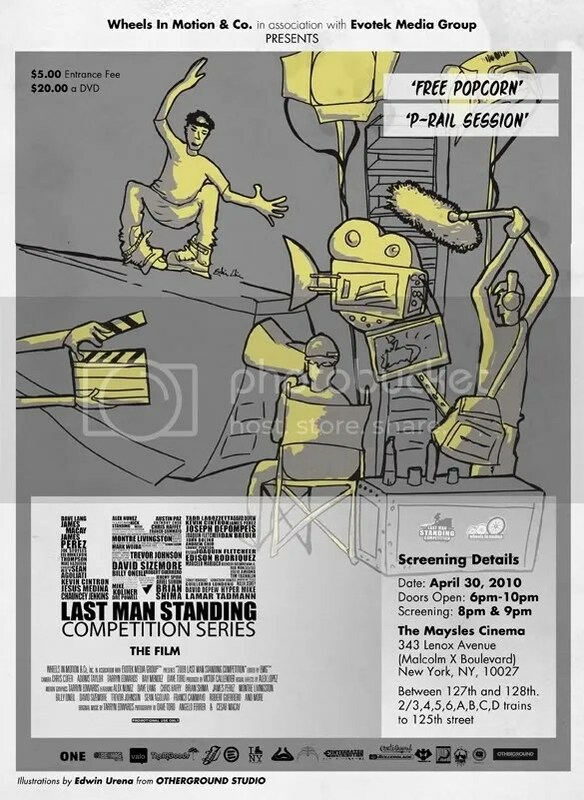 This event series, which was independently organized & produced by Victor Callender is the longest running skate event series on the East Coast. In addition to the live events Wheels In Motion has partnered with Evotek Industries, who are all skate culture filmmakers to capture the essence of these events on film & bring that to the world audience at large. Skaters: David Sizemore, Mathias Silhan, Chris Haffey, Billy O’Neil, Brian Shima, Montre Livingston, Dre Powell, Alex Nunez, Robert Guerrero, Franco Cammayo, James Perez, Dave Lang and Chauncey Jenkins. 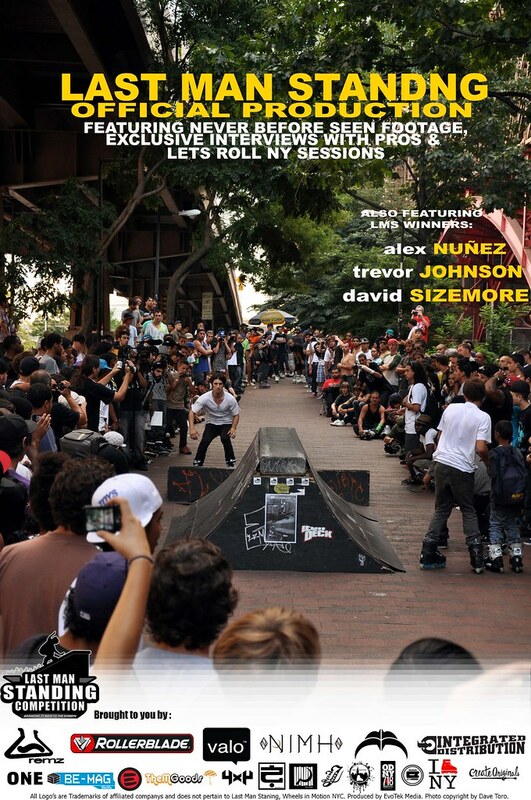 Thanks to our sponsors: Integrated Distribution, Rollerblade, Sixwonsix, Valo, Edthirteen ThemGoods, Ground Control, Valo, Be-Mag, ONE, Jin Joint, Razors, Create Originals, I Roll NY, Art Of Rolling, Eulogy and the skate community and spectators for supporting this movement” – Victor Callender. The event has been postponed until tomorrow, Sunday the 25th and will run from 2:00pm – 6:00pm. Please come out and show your support. Invite your friends and family to partake in the session and fundraiser. 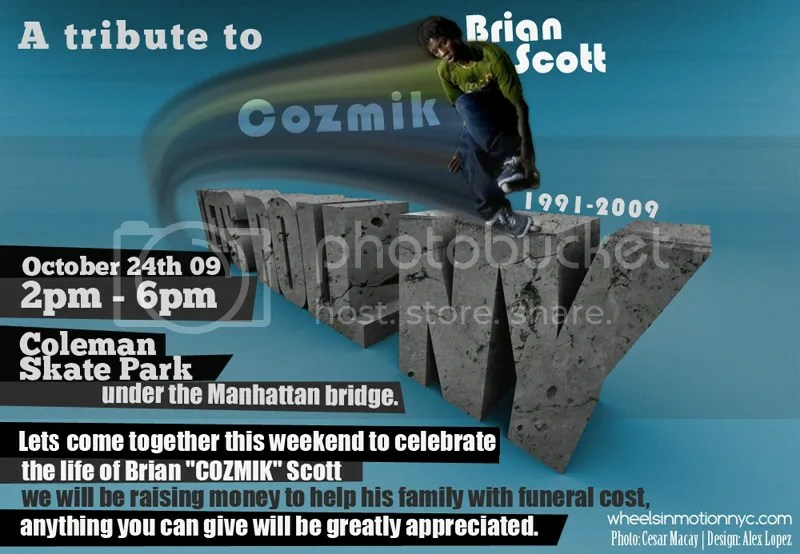 All proceeds will be going to Cozmik’s family.